There are some serious attempts to deal with the fact that pace in movies has some impact of how a movie succeeds, in dramaturgical terms. I’d like to introduce an article by Mike Baxter, Daria Khitrova, Yuri Tsivian: „A Numerate Film History? Cinemetrics Looks at Griffith, Griffith Looks at Cinemetrics“. Yuri Tsivian and his colleagues found a very old proof that the topic I am devoted to – Movie Pulse – has been in discussion already 90 years ago. The mentioned article of the people above is dedicated to find similarities and points of contact for their own work: cinemetrics.lv, a database for analyzing the montage of movies. But as Yuri Tsivian introduced me the little-known essay “Pace in the Movies” by David Wark Griffith, published in The Liberty Magazine in 1926, I could hardly believe what I am seeing and reading: A woman trying to get her average heart beat while watching a movie, captioned: „Fans will find it fascinating to measure their pulse beats with the pacing of motion pictures.“ Baxter, Khitrova and Tsivian even considered it might be a hoax or at least an essay from a pretender, but no. It’s written by David W. Griffith. “Pace in the Movies” by David Wark Griffith · Fans will find it fascinating to measure their pulse beats with the pacing of motion pictures. Griffith explains the relation of the heart beat and pace, which he refers to as „the ebb and flow of pleasurable tides of excitement, the rhythmical movement of events toward the ecstatic consummation of romantic and adventurous dreams“. He makes several attempts to explain the formal movie structure of sequential images and their narrative structure in sequences, scenes and shots to make the readers aware of the need and use of different pace. And he does not only focusses on various climax’ and increase only; he refers to slow down and retardation as well. At the end of the essay he encourages the readers to make a self-experiment to measure their own pulse while watching certain scenes in a movie. „You will find that it is, for the very good reason that the whole science of pace in the drama is founded upon your pulse.“ Well said (in 1926). 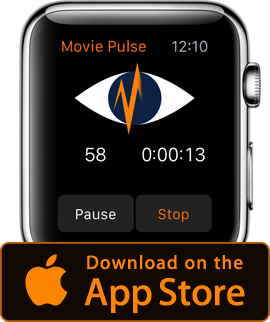 Although today I strongly disagree to do it at the second screening – you can do it instantly with Movie Pulse and a Apple Watch. Just press „start“ at the studio fanfare.